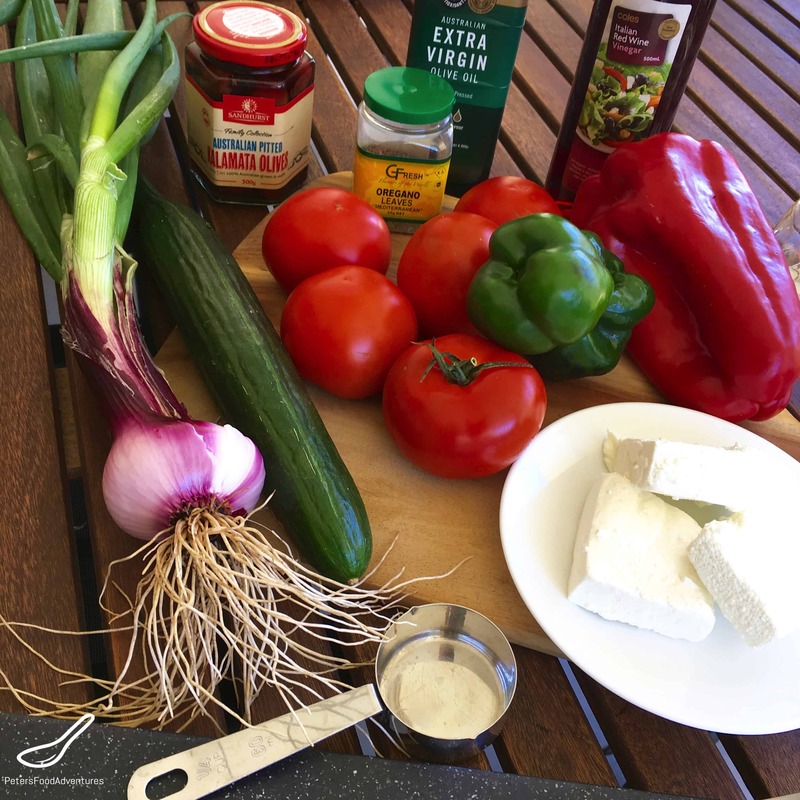 Everyone loves a traditional Greek Salad recipe (known as Horiatiki in Greece), a staple of Greek cuisine! It’s so easy to make! It’s an essential summer salad for a backyard Bbq or a Potluck meal. This salad is typically made with tomatoes, cucumbers, red peppers, olives and red onion. Traditionally the red onions are cut into rings, but I tend to chop all the ingredients the same size including the onion, so it’s easier to eat. Please don’t buy the black olives sold in cans. They are tasteless and are of poor quality. Which Olives for Greek Salad? The tastiest olives for this salad are dark purple Kalamata Olives, either sold fresh in the deli or in glass jars. Kalamata Olives are also sold as Kalamon Olives, only if they are not grown in the Kalamata region of Greece. It’s the same meaty flavorful olive, just with a different name because of where it was planted. I recommend buying the pitted olives. Nobody likes to bite into a Greek Salad and break a tooth on an olive! 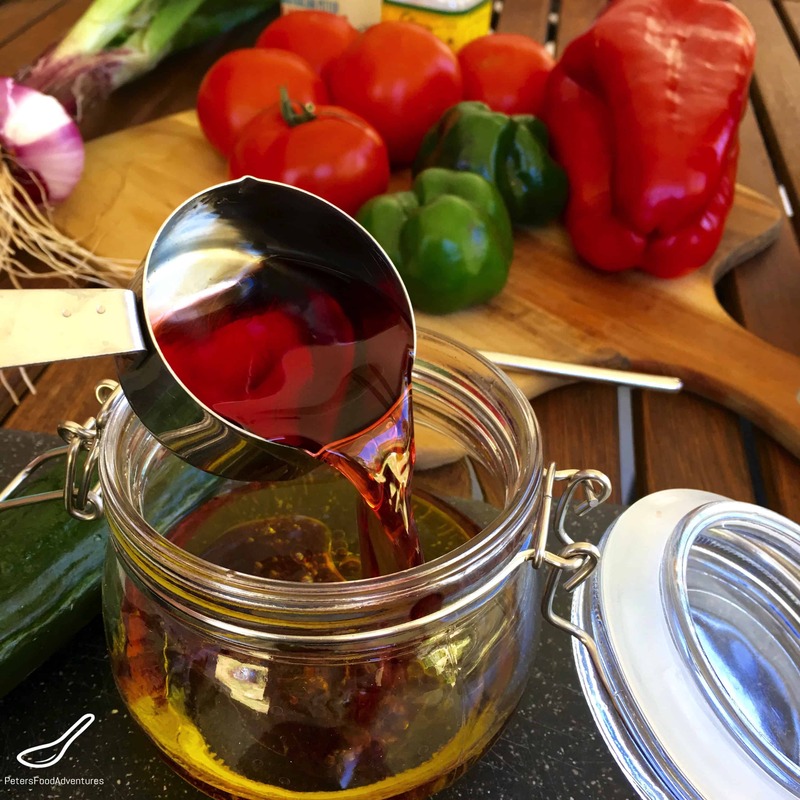 Don’t buy your Greek Salad Dressing, it’s so easy to make, ready to pour over your salad. Make the dressing before the salad to allow the flavors meld together. When making salad dressings, sometimes I use an old glass jar, put the lid on and shake the flavors together to emulsify. Remember to give it a shake again before pouring over the salad. Traditional Greek Salad should never be served with lettuce as a way to fill your salad bowl. It’s just a stingy and cheaper way of making this salad, and is sadly becoming more popular with restaurants. It’s much tastier and healthier with only vegetables, as it was intended. An easy summertime traditional Greek Salad recipe with Easy Dressing, perfect for any time of year. Bon Appetit! Приятного аппетита! Traditional Greek Salad with Oregano Salad Dressing Vinaigrette! Packed with Feta, Tomatoes, Peppers and Onions, so easy and delicious! Whisk the Olive Oil, Red Wine Vinegar, Salt and Oregano and set aside for the flavours to meld together. Set aside. Can add 2 tablespoons of Lemon Juice for extra zing in the Greek Salad Dressing! This is what is needed this morning for breakfast. I know you don’t normally eat salad for breakfast, but where I am in South Africa it is 5.30am and already the temp is high and humid as all hell. Healthy and tasty. Thanks for sharing! Thanks for checking it out! ???? Hi I was wondering how many servings does this salad recipe make?